Cloying sweetness or cultural icons? 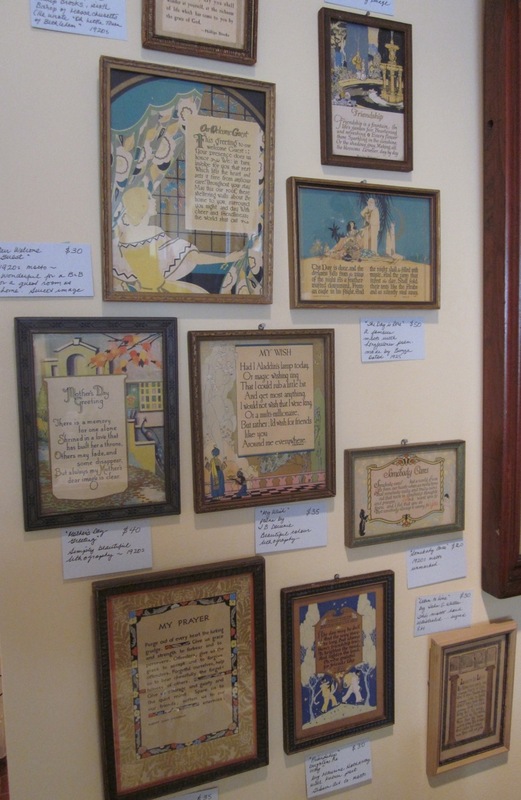 These charming mottoes in their adorable period frames were popular in America and Canada in the 1920s and 30s, a time of rapid industrialization. They appealed to the sentiments of those folks moving from farms to factories and missing the old days and the old ways. Famous greeting card companies such as Buzza, The Gibson Art Company and P.F. Volland commissioned poets such as Maurine Hathaway, or used already published poems by people like Robert Lewis Stevenson and Rudyard Kipling. Their lithography is outstanding…and while their sentiments may be a little syrupy for today’s sensibilities, I think they are a wonderful example of how cultural change drives home decoration. Priced from $20 to $45, these mottoes would be wonderful hung close together in a group on a wall in your home or office! This entry was posted in What's fascinating us…, General.